Outside the city; off the main roads. Tired of hacking and coughing after cotton fields get sprayed to open their bolls? Tired of losing your garden or organic crops to Roundup drift? Now there are two precedents for legal recourse. Purveyors of conventional and genetically-modified (GM) crops — and the pesticides and herbicides that accompany them — are finally getting a taste of their own legal medicine. Minnesota's Star Tribune has reported that the Minnesota Court of Appeals recently ruled that a large organic farm surrounded by chemical-laden conventional farms can seek damages for lost crops, as well as lost profits, caused by the illegal trespassing of pesticides and herbicides on its property. Oluf and Debra Johnson's 1,500-acre organic farm in Stearns County, Minn., has repeatedly been contaminated by nearby conventional and GMO farms since the couple started it in the 1990s. A local pesticide cooperative known as Paynesville Farmers Union (PFU), which is near the farm, has been cited at least four times for violating pesticide laws, and inadvertently causing damage to the Johnson's farm. The first time it was realized that pesticides had drifted onto the Johnson's farm in 1998, PFU apologized, but did not agree to pay for damages. As anyone with an understanding of organic practices knows, even a small bit of contamination can result in having to plow under that season's crops, forget profits, and even lose the ability to grow organic crops in the same field for at least a couple years. And all most people have done so far is let it slide. But the Johnsons did something. The Johnson's let the first incident slide. But after the second, third, and fourth times, they decided that enough was enough. Following the second pesticide drift in 2002, the Johnson's filed a complaint with the Minnesota Agriculture Department, which eventually ruled that PFU had illegally sprayed chemicals on windy days, which led to contamination of the Johnson's organic crops. But that didn't stop the spray drift. After enduring much hardship, the Johnson's finally ended up suing PFU in 2009 for negligence and trespass, only to receive denial from the district court that received the case. But after appealing, the Johnson's received favor from the Appeals Court, which ruled that particulate matter, including pesticides, herbicides, and even GM particulates, that contaminates nearby fields is, in fact, considered illegal trespass, and is subject to the same laws concerning other forms of trespass. 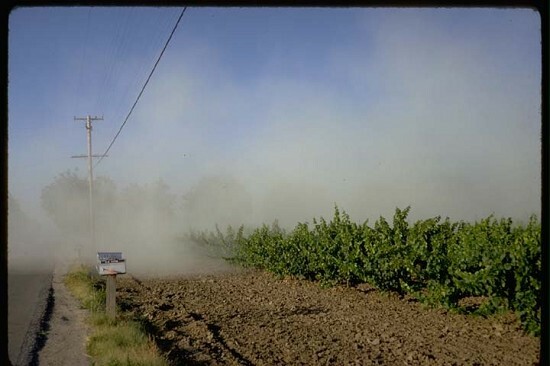 In a similar case, a California-based organic farm recently won a $1 million lawsuit filed against a conventional farm whose pesticides spread through fog from several miles away, and contaminated its fields. Jacobs Farm / Del Cobo's entire season's herb crop had to be discarded as a result, and the court that presided over the case acknowledged and agreed that the polluters must be held responsible. So, now you can sue about pesticide drift and there is legal precedent to win. Lois Moon on Pine pollen early this year? Pine pollen early this year?